The governor of Virginia, , along with the other Colonial governors, was instructed by Great Britain, in 1753, to serve notice on the French that their forts built on western lands claimed by the English were an encroachment. He was also ordered, if the French resisted, to employ force. 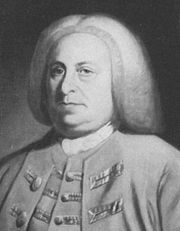 The Lieutenant Governor of Virginia, Robert Dinwiddie (1692 � 1770), was not prepared to let the French claim the Ohio Valley. He had a vested interest in the success of the Ohio Company. The company had given him shares in the company . The area was of great interest to the Virginians . Washington arrived the next day at Fredericksburg, he engaged as French interpreter his former fencing-master, Jacob Van Braam (1729 - 1792 ), who had also served with his older brother Lawrence. The Indian interpreter was John Davidson. He arrived at what is now Cumberland, Major Washington engaged as guide Christopher Gist, a trader who had made settlements and taken possession for the Ohio Company of the country claimed by both nations ; and also engaged as aids four other men, two of them Indian traders. Heavy rains and deep snows made the forests even more than commonly difficult . On December 4th they found the colors of the French hoisted on a house from which they had driven John Frazer,an English subject. Washington approached and found three officers, one of whom, Captain Chabert de Joncaire, son of a French officer and a Seneca squaw, said that he had command of the Ohio, but advised Washington to apply for his answer to a general officer at the neighboring fort. Inviting the English party to dinner, he treated them with French courtesy, until conviviality got the better of discretion.
" The Wine, as they dosed themselves pretty plentifully with it, soon banished the restraint which at first appeared in their Conversation ; and gave a Licence to their tongues to reveal their Sentiments more freely.
" They told me, That it was their absolute Design to take Possession of the Ohio, and by God they would do it ; For that although they were sensible the English could raise two Men for their one ; yet they knew their motions were too slow and dilatory to prevent any undertaking of theirs." Letter of The Governor of Virginia, Robert Dinwiddie, to the French Commander, which was delivered by Washington to the French commander at Fort Le Boef, Captain Jacques Legardeur de Saint Pierre (1701 - 1755 ). The Lands upon the River Ohio, in the Western parts of the Colony of Virginia, are so notoriously known to be the Property of the Crown of Great-Britain ; that it is a matter of equal Concern and Surprise to me, to hear that a Body of French Forces are erecting fortresses, and making settlements upon that River, within his Majesty's Dominions. The many and repeated complaints I have received of these Acts of hostility, lay me under the Necessity, of sending, in the Name of the King my Master, the Bearer hereof, George Washington, Esq ; one of the Adjutants General of the Forces of this Dominion ; to complain to you of the Encroachments thus made, and of the Injuries done to the Subjects of Great- Britain, in the open violation of the Law of Nations, and the Treaties now subsisting between the two Crowns. If these Facts are true, and you shall think fit to justify your Proceedings, I must desire you to acquaint me, by whose Authority and Instructions you have lately marched from Canada, with an armed Force ; and invaded the King of Great-Britain's Territories, in the Manner complained of ? that according to the Purport and Resolution of your Answer, I may act agreeably to the Commission I am honored with, from the King my Master. However, Sir, in Obedience to my Instructions, it becomes my Duty to require your peaceable Departure ; and that you would forbear prosecuting a Purpose so interruptive of the Harmony and good Understanding, which his Majesty is desirous to continue and cultivate with the most Christian King. Williamsburg, in Virginia, October 31, 1753. 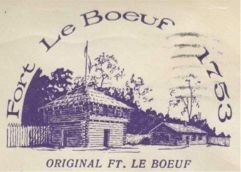 On December 12, 1753, Washington arrived at Fort Le Boeuf ( present-day Waterford, Pennsylvania ) . Jacques Legardeur de Saint-Pierre invited Washington to dine with him that evening. 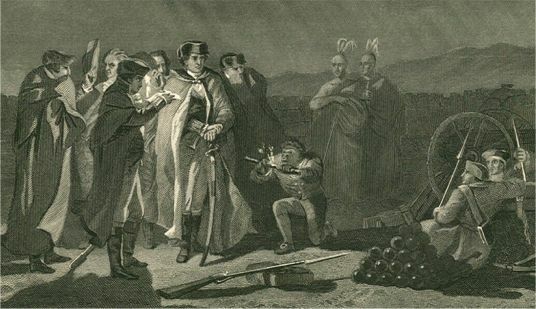 Over dinner, Washington presented Saint-Pierre with the letter from Dinwiddie that demanded an immediate French withdrawal from the Ohio Country. Saint-Pierre was quite civil in his response, saying, "As to the Summons you send me to retire, I do not think myself obliged to obey it." The French explained to Washington that France's claim to the region was superior to that of the British, since Rene-Robert Cavelier, Sieur de La Salle (1643�1687) had explored the Ohio Country nearly a century earlier. The French Commandant sent the letter to Quebec . This signaled to both sides that they should occupy the valley as soon as possible . Washington, led a small force of 132 Virginian militia to the site of modern day Pittsburgh and started to build a fort. On April 16, a large French force under Claude Pecaudy de Contrecoeur arrived and ordered Washington and their men to leave, which they did. 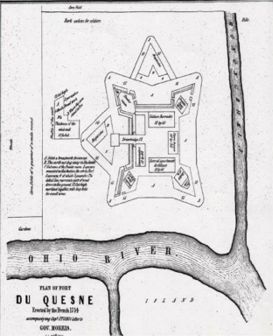 The French finished the fort, which they called Fort Duquesne . After the French built Fort Duquesne, Dinwiddle and Washington made alternate plans to conquer the Ohio Valley . This was to build a road with supply depots about 100 miles long to bring supplies up to attack Duquesne. The French commander of the fort, Claude-Pierre P�caudy de Contrec�ur was aware that the English were somewhere nearby and sent a small force of around 40 men under Sieur de Jumonville (1718 - 1754 ) to request the English forces to leave as their two countries were not formally at war . Washington heard of this party of Frenchmen who he thought might be a raiding party. However, if this was so, it is strange that the French did not set up sentries when they came upon them at dawn after an all night march. The French and the English both claimed the others side fired first. This party was ambushed by Washington with 40 Virginians and around 30 Indians, who thought it was a French war party and de Jumonville was killed along with 9 or ten others and 20 captured .This small battle was to ignite a war when news of it reached Versailles and London . According to one report, Jumonville was murdered by Tanaghrisson, a leader of some Ohio Mingo Indian in front of a shocked Washington while Jumonville while a meeting was held after a cease-fire. Tanaghrisson hoped that by murdering Jumonville, the English would support him. Tanaghrisson was unable to gain support of other Ohio Indians to attack the French. He had no confidence in the small fort Washington had constructed and left the area. In Washington's own journal, he claims Jumonville was killed in the first volley of the skirmish. Washington sent 21 of the French Canadians back to Dinwiddle with instructions that anything they said should be discounted, as they were spies . Could it have been a possible cover up by Washington ? The fight led to some charges against " the cruel Washington," as he is called by a French chronicler of the time. The prisoners informed him that they had been sent with a summons ordering him to depart, � a plea which Washington treated as a pretence to cloak their real object, of discovering the camp and learning what they could about the English forces and situation. According to Washington French deserters told him that the party came as spies, and were to show the summons only if threatened by a superior force. in the backwoods of America set the world on fire. 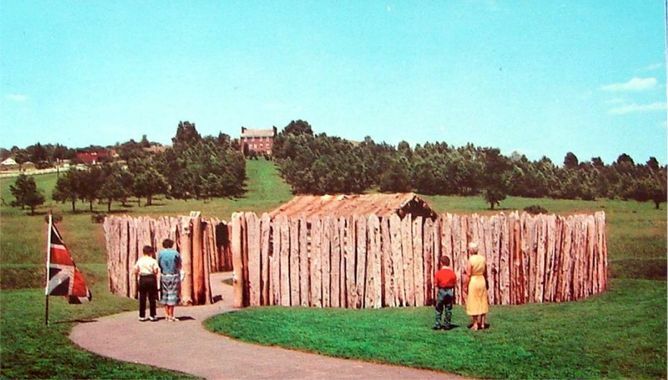 Washington built a fort nearby, which was to become Fort Necessity ( near Farmington, Pennsylvania ) . De Contrecoeur raised a force of 500 French soldiers, militia men and 300 Indians to go after the 400 Virginians under Washington at Fort Necessity and surrounded Washington's fort in early July .The French, without artillery, poured heavy musket fire into the fort, killing 31. The fight happened in the rain, the French were able to keep their powder dry due to the overhanging leaves. Washington and his men, huddled in their small fort were not able to return as much fire as their powder became wet. Luckly for Washington, the French had about exhausted their ammunition supply and offered Washington surrender with the honors of war. Washington surrendered and signed an agreement that the area was in the domain of France and was able to return to Virginia on July 4. Hostages were given to the French to be exchanged for the French prisoners . Some stragglers were captured with a few being scalped by French allied Indians . Dinwiddie used this as a justification to break the terms of Washington's agreement. Washington, who did not read French, did not know that when he signed the document of surrender, that he admitted that he and his men had murdered Jumonville. The French also found Washington's journal in Washington's camp, the information and this and the death of Jumonville were used by the French as a pretext to eventually declare war. The leadership of France was not eager to go to war. The huge debts of Louis XIV were being paid off and France was in the middle of modernizing and expanding it's fleet. France proposed the Ohio country be demilitarized. In England there was alarm. 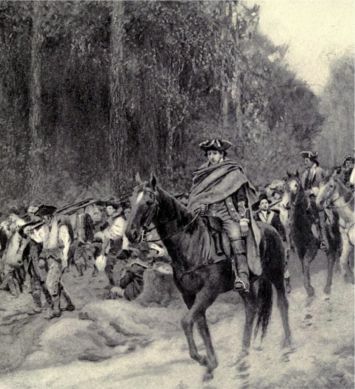 Washington left two hostages with the French, One of the hostages, Captain Robert Stobo ( 1727 - 1770 ), a Scotchman, was held for years at Quebec. 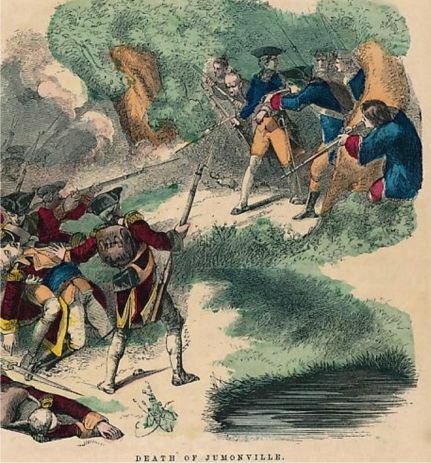 In 1759 he escaped, and, joining a British army, pointed out to General Wolfe a path up a cliff, in a little cove called Anse de Foulon, which led to the capture of Quebec . A few months after Washington's surrender on July 4,1754, eight of the thirteen colonies sent representatives to Albany to work together for common defense . Representatives of the Iroquois were also invited . Although the Iroquoi representatives were loaded with gifts from the meeting, they declared neutrality in case of war .This was an idea of Benjamin Franklin. He proposed the style of government of the Iroquois to unite the colonies, the Albany Plan of Union . However, his hopes for a unified approach to the French and Indians problems came to nothing. It would be ten more years before the colonies were to unite .